Next week we will be seeing that holiday staple, the Christmas tree, that gave its all for Christmas cheer, forlorn and discarded by the hundreds at the curbside. Ewing Township, of course, collects your tree at the curb for recycling into mulch to be used around local parks, however, there are also many environmentally- and taxpayer-friendly ways you can use your tree on your own property. Reuse your Christmas tree around your home and in your yard this winter and not only will you nourish the landscape, providing valuable resources and habitat for the environment, but you can also help reduce staff time with tree pickup, saving taxpayer dollars. Evergreens provide winter insulation for tender plants in your yard and reduce frost heaving. Cut the boughs from the tree and place them over any delicate plants for the winter. They also help alleviate the weight of snow on branches that might otherwise break from the added load. 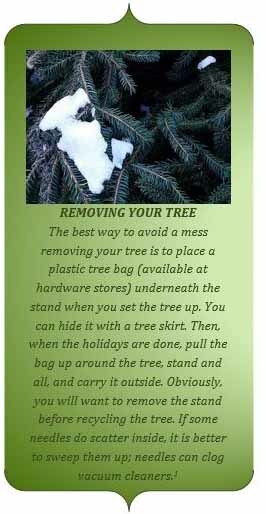 Needles from your tree dry out quickly and decompose slowly. They make an excellent mulch for the garden. Pine needles are full of nutrients that can reduce the PH of your soil if its more alkaline. Many on a branch fall off the boughs placed in the beds during the winter. You can use your tree as firewood, but not right away. The wood is wet and can pose a fire hazard. Cut your tree up and let it dry out and then use in an outdoor fire pit. It’s not good with an inside fireplace, but works well outside. Make a sachet from the tree’s pine needles to keep that Christmas scent in your home throughout the New Year. Sunk into private fish ponds, trees make an excellent refuge and feeding area for fish. The creative and crafty among us can make round coasters from the trunk. These are just a few suggestions garnered from our own usage and around the web. Perhaps you can think of more. The Ewing Green Team hopes you all had a great holiday season and sends best wishes for a wonderful New Year.